David M. Richardson is Professor in the Department of Botany & Zoology at Stellenbosch University, South Africa, and Director of the DST-NRF Centre of Excellence for Invasion Biology. He is one of the most prolific authors in invasion ecology and was awarded the 2006 Hans Sigrist Prize and the 2012 John Hershel Medal of the Royal Society of South Africa for his work in this field. He is a Fellow of the Royal Society of South Africa, Member of the Academy of Science of South Africa and since 1998 has been Editor-in-Chief of the international journal Diversity and Distributions (Wiley-Blackwell). 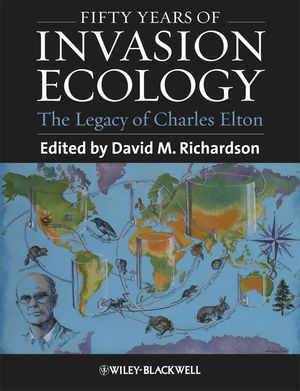 1 A world of thought: 'The Ecology of Invasions by Animals and Plants' and Charles Elton's life's work (ROGER L. KITCHING). 2 Charles Elton: neither founder nor siren, but prophet (DANIEL SIMBERLOFF). 3 The inviolate sea? Charles Elton and biological invasions in the world's oceans (JAMES T. CARLTON). 4 The rise and fall of biotic nativeness: a historical perspective (MATTHEW K. CHEW AND ANDREW L. HAMILTON). PART 2 EVOLUTION AND CURRENT DIMENSIONS OF INVASION ECOLOGY. 5 Patterns and rate of growth of studies in invasion ecology (HUGH J. MACISAAC, RAHEL A. TEDLA AND ANTHONY RICCIARDI). 6 Invasion ecology and restoration ecology: parallel evolution in two fi elds of endeavour (RICHARD J. HOBBS AND DAVID M. RICHARDSON). PART 3 NEW TAKES ON INVASION PATTERNS. 7 Biological invasions in Europe 50 years after Elton: time to sound the ALARM (PETR PYŠEK AND PHILIP E. HULME). 8 Fifty years of tree pest and pathogen invasions, increasingly threatening world forests (MICHAEL J. WINGFIELD, BERNARD SLIPPERS, JOLANDA ROUX AND BRENDA D. WINGFIELD). PART 4 THE NUTS AND BOLTS OF INVASION ECOLOGY. 9 A movement ecology approach to study seed dispersal and plant invasion: an overview and application of seed dispersal by fruit bats (ASAF TSOAR, DAVID SHOHAMI AND RAN NATHAN). 10 Biodiversity as a bulwark against invasion: conceptual threads since Elton (JASON D. FRIDLEY). 11 Soil biota and plant invasions: biogeographical effects on plant–microbe interactions (RAGAN M. CALLAWAY AND MARNIE E. ROUT). 12 Mutualisms: key drivers of invasions ... key casualties of invasions (ANNA TRAVESET AND DAVID M. RICHARDSON). 13 Fifty years on: confronting Elton's hypotheses about invasion success with data from exotic birds (TIM M. BLACKBURN, JULIE L. LOCKWOOD AND PHILLIP CASSEY). 14 Is rapid adaptive evolution important in successful invasions? (ELEANOR E. DORMONTT, ANDREW J. LOWE AND PETER J. PRENTIS). 15 Why reproductive systems matter for the invasion biology of plants (SPENCER C.H. BARRETT). 16 Impacts of biological invasions on freshwater ecosystems (ANTHONY RICCIARDI AND HUGH J. MACISAAC). 17 Expanding the propagule pressure concept to understand the impact of biological invasions (ANTHONY RICCIARDI, LISA A. JONES, ÅSA M. KESTRUP AND JESSICA M. WARD). PART 5 POSTER-CHILD INVADERS, THEN AND NOW. 18 Elton's insights into the ecology of ant invasions: lessons learned and lessons still to be learned (NATHAN J. SANDERS AND ANDREW V. SUAREZ). 19 Fifty years of 'Waging war on cheatgrass': research advances, while meaningful control languishes (RICHARD N. MACK). PART 6 NEW DIRECTIONS AND TECHNOLOGIES, NEW CHALLENGES. 20 Researching invasive species 50 years after Elton: a cautionary tale (MARK A. DAVIS). 21 Invasions and ecosystems: vulnerabilities and the contribution of new technologies (PETER M. VITOUSEK, CARLA M. D’ANTONIO AND GREGORY P. ASNER). 22 DNA barcoding of invasive species (HUGH B. CROSS, ANDREW J. LOWE, C. FREDERICO D. GURGEL). 23 Biosecurity: the changing face of invasion biology (PHILIP E. HULME). 24 Elton and the economics of biological invasions (CHARLES PERRINGS). 25 Modelling spread in invasion ecology: a synthesis (CANG HUI, RAINER M. KRUG AND DAVID M. RICHARDSON). 26 Responses of invasive species to a changing climate and atmosphere (JEFFREY S. DUKES). 27 Conceptual clarity, scientifi c rigour and 'The Stories We Are': engaging with two challenges to the objectivity of invasion biology (JOHAN HATTINGH). 28 Changing perspectives on managing biological invasions: insights from South Africa and the Working for Water programme (BRIAN W. VAN WILGEN, AHMED KHAN AND CHRISTO MARAIS). 29 Invasion science: the roads travelled and the roads ahead (DAVID M. RICHARDSON). 30 A compendium of essential concepts and terminology in invasion ecology (DAVID M. RICHARDSON, PETR PYSˇEK AND JAMES T. CARLTON).